Buses from Dubrovnik to Korcula leave Dubrovnik’s main bus station once a day at 15:00 hrs, arriving in Korcula at 18:15. The bus goes along the Croatian coast towards village Doli in vicinity of Ston – where the Peljesac peninsula is connected to the mainland. At this point, the bus turns left and drives along Peljesac to Orebic. Once the bus arrives at Orebic (a small coastal town on Peljesac, which is the closest to Korcula) it drives to Orebic ferry terminal and embarks on the car ferry Orebic – Korcula (Domince). This ferry journey lasts about 15 minutes. Arriving on the island, at the ferry port of Domince, the bus drives further and takes passengers directly to Korcula Town at the main bus station. The same bus then continues further along the Island towards Vela Luka. The bus ticket from Dubrovnik to Korcula Town cost about 100 Kuna. The ferry ticket is included in the price. 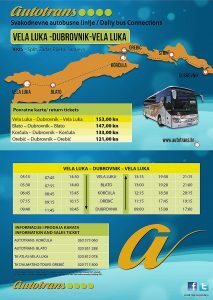 Please, note, on Sundays bus sometimes leaves Dubrovnik at 18.00 arriving in Korcula at 21.30. Please, check with the bus company current Sunday schedule. Note, in the high season the bus company runs Dubrovnik to Korcula bus 3 times a day (see below) while in the winter it is only once a day. IMPORTANT NOTE: This is a screenshot of timetable that I found on Arriva site. Please make sure to double/triple check at their site, as companies can change bus timetables any time they wish. The bus from Dubrovnik to Orebic leaves from Dubrovnik’s main bus station. It goes once every day at 14:15 hrs and arrives in Orebic at 16:15. This line does not operate on Sundays and public holidays. This bus also drives along the Croatian coast between Dubrovnik and Doli (as above) – where the Peljesac Peninsula is connected with the mainland. At this point, the bus turns left and drives further along the Peninsula to Orebic. Once in Orebic, you can take the passengers ferry from Orebic to Korcula Town. This ferry sails 5 to 13 times daily, depending of the day of the week and season – during the summer it is more frequent than in the winter months. The journey takes 10 minutes. Ticket price is 12 Kuna. If this ferry is not available, you can try to take car/passenger ferry to Domince (Korcula) that operates at least 10 times a day, every day. The ferry ticket costs 14 Kuna per person.